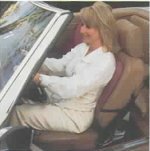 BetterBack Seat cushion: A portable and foldable back support that is ergonomically designed to support proper neutral spine alignment and to promote correct posture while sitting in different positions. Also add great orthopedic stability to the pelvis providing more integrity to a weak back. 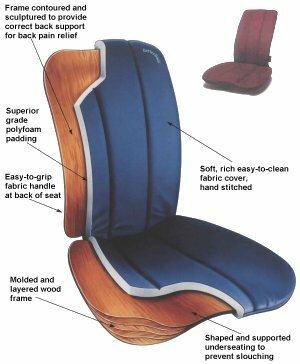 Comfortable padding with anatomically correct seating is essential for both good health and personal well being. 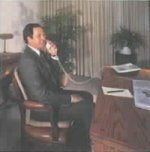 Sitting improperly in the same position for extended periods of time can cause unnecessary headaches, strain and excess fatigue. Our manufacturer prides itself in the design and manufacturing of high quality back supports that are specifically structured to follow the natural shape of the human body. Constructed of upholstered, contoured wood, these portable products are used world wide. Accuback Backhugger Lumbar Support - Accuback Backhugger lumbar support acts as a lumbar cushion to support the lower back & ease lower back pain. BedLounge & LegLounger Reclining Support Pillows | Recovery | Reading - BedLounge and LegLounger offer a better, ergonomic way to read in bed, lounge, recover or just recline in extraordinary comfort. Thermarest BackRest by Cascade Designs - Portable & self-inflating adjustable lumbar cushions, perfect for airplane travel or car seats.